Making a Homemade BioSand Filter System is Easy! A BioSand Water Filter only needs 2 containers, gravel, and sand to work. It is an inexpensive answer to water filtration. Clean H2O is important to our survival. The BioSand Water Filter uses sand, gravel, and gravity to create clean water. It can be made quickly with the right materials and it can apply to a container as small as a water bottle with a straw sticking through the side or as large as a 55 gallon drum H2O barrel with full piping and rigging. In the image there are two commercial water containers that have been altered and converted into a system to produce clean water through a process known as a BioSand water filter system. This is an example of one you can build with salvaged materials. Think about building one in a permanent spot for your home or bug out shelter. I want to put one of these to work so I can not only have clean, drinkable water, I can use it to reclaim some of the water I would normally pour down the drain. Using a dishpan in the kitchen sink will enable you to pour the water into the filter. When it seeps back through the filter it can be used to water plants or be ready filtered drinking water. I like this idea as you don't have to do more than cut an opening in one of these containers and you have a spicket (water spout) already to go without hassles! Cut the top so that you can get to the top of the BioSand Water Filter easily and remove contaminants that build up. You will need to funnel the clean water produced by the system into another container. 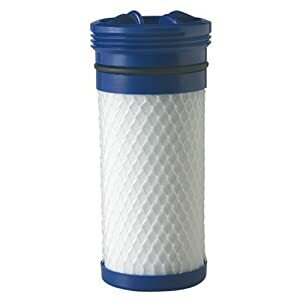 Be sure to include a cover on the filter so that what you are taking out of the water doesn't go back in it! NOTE: Choose a container that features a water spout that has a handle that can be locked in the OPEN position. If you want to use another container create a hole in the side at the bottom that you can fit a pipe into so the freshly filtered water may drip back out into a clean catch container. The process is simple. Removing debris and bacteria is the function of the BioSand Water Filter. It can be constructed from purchased or scavenged parts and will help you obtain small amounts of clean H2O for drinking. The easier you can turn non-potable water into quality drinking water the better off you can be in your survival preparedness regiment. The advantage of having a good water filter is beyond measure. The safer your drinking water the healthier you are going to be. 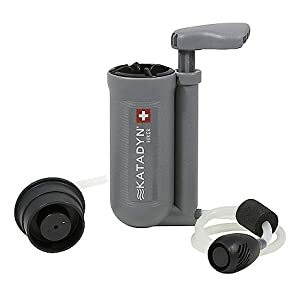 A great example of a water filter to add to a bug out kit would be the Katadyn Hiker Microfilter. This portable filter is a lightweight workhorse weighing only 11 oz. and can filter up to 200 gallons without needing a filter change. In it's processes you will find a quick and simple method for unclean to drinkable water in a few minutes. This is a durable tool and a great way to have safe and drinkable H2O. You will need a replacement filter occasionally, so stock up and take stock in knowing you have a way to create clean water. The Aquamira Frontier Emergency Filter is a little dynamo. It operates much like a drinking straw and is in my personal 72 hour kit. It will process 60 gallons of water before it's filtering capabilities are exhausted. It is very handy for ridding water of contaminants.